Shortly after Queen + Adam Lambert finished their over-the-top two hour and twenty minute performance at the Bridgestone Arena in Nashville, Tennessee on August 2, 2017 - I asked the diehard fan next to me how he liked the show. His reply was "honestly, that felt like a Queen tribute band" and his answer really came as no surprise. 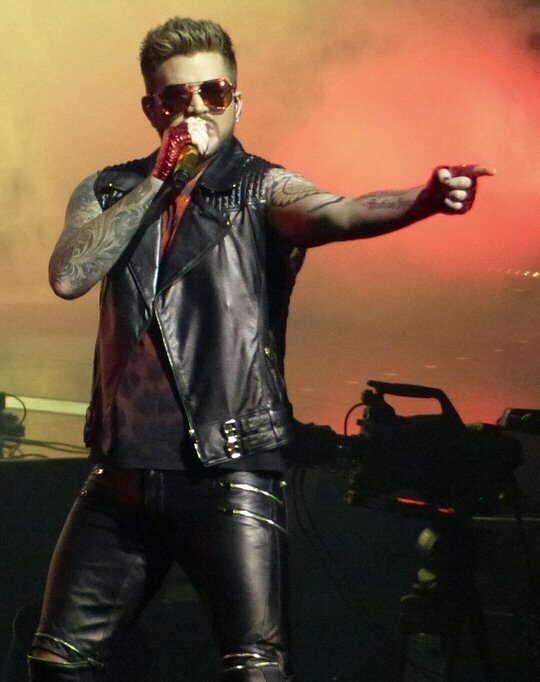 Adam Lambert rocks the Bridgestone Arena in Nashville. This gentleman was in Music City with his son visiting from Atlanta and while he had never seen the band in their heyday he did see the version that toured with legendary vocalist Paul Rodgers in 2008. He said that concert felt more like the "real Queen" to him. All one needs to do is read the billing on the marquee to get a greater understanding of what went down in Tennessee - it was Queen plus Adam Lambert - and they weren't trying to be anything more than that. The Queen fanatic to our right made a few additional observations. He said the boys would make the crowd wait a bit to build up the anticipation and excitement to the point of angering the fans and sure enough - he was right. Right before the lights went down at 8:40 p.m. there were a few mad shouts of "come on, already" but all was forgiven as the pomp and circumstance started to unfold. The curtain lifted and the band immediately hit the sold-out crowd with "We Will Rock You" followed by the driving "Hammer to Fall". The parade of hits followed including the disco-era "Another One Bites the Dust" and early favorites "Fat Bottomed Girls" and "Killer Queen". 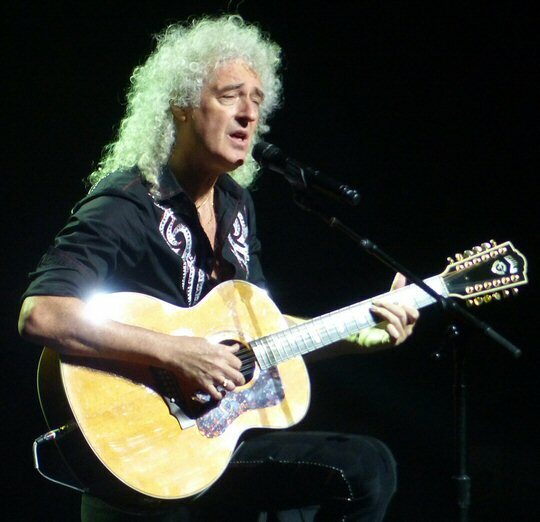 Brian May thrilled on electric and acoustic as the Music City tour stop. Our Queen historian from Atlanta also recalled how back in the day the band didn't really need more than their presence and musical prowess to win over an audience. He reminisced on how they paved they way as a stadium act breaking down international barriers everywhere they went on the strength of their captivating songs. So, it was kind of surprising to see all the bells and whistles the royal rockers had in store for their loyal subjects. A notable presence was a giant portion of the robot from the News of the World album cover that emerged from the floor with Lambert catching a ride on its noggin while remarking it "gave great head". At the start of "Bicycle Race" a flashy pink trike emerged in the same manner and the American Idol alum took it for a spin around the giant guitar shaped stage that jutted out far into the floor section of the arena. There was also ample use of lasers, lighting and confetti but the music remained the star of the show. "I know what some of you fans are saying: 'He's no Freddie Mercury,' " Lambert said acknowledging the difficult position he was in trying to stand in for the beloved singer who died from complications of HIV in November of 1991. Still, the Mercury made his presence felt via video screen first sharing a duet with guitarist Brian May on "Love of My Life" before trading lines with Lambert in the final verse of the set-closing "Bohemian Rhapsody". Roger Taylor held down a steady beat - no click track required. The reality on the ground is that it can't really be Queen any longer with only 50 percent of the original quartet represented in these latter years for the band. But, two very important components were on stage. May is the man-genius who still thrilled on guitar even while he unveiled his latest invention - a spectrographic selfie camera - which he put to use on the Nashville faithful. Drummer Roger Taylor reminded us how he was the group's secret weapon with his robust second vocals powering the potent tunes. Behind the kit he was solid as he remarked that they never needed a click track and they "know the tempos". Queen + Adam Lambert impressed as they delivered their classic rock with reverence and vigor. In total their were six players on stage rounded out with a bass player, keyboardist and an additional percussionist. 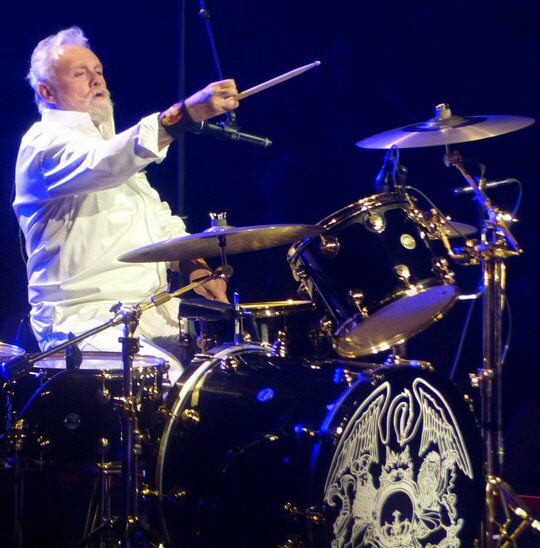 Lambert was in good voice for the whole show and he remain energized and amazed to have ascended to this unlikely role even as he began to carve out his way as a member of Queen in good standing. His racy "Two Fux" was dedicated to Freddie and it pranced along in classic Queen style boding well for the band if they ever decide to record a full length with their regal reality show find. The love fest between band and audience continued with a six-pack of love songs with a barely a moment in between to recharge. "I'm in Love With My Car", "Get Down, Make Love", "Somebody to Love" and "Crazy Little Thing Called Love" proved there was still enough love to go around on the group's successful 25-city North American tour that was nearing its end in Nashville. Brian May took a spectrograph style selfie in Nashville. "Radio Gaga" was a main set highlight but it didn't come close to the captivating version the whole world saw in 1985 when Freddie and the boys ruled the day at Live Aid. Still, with the bulk of the work completed the group returned for the obligatory encore of "We Will Rock You (reprise)" and "We Are the Champions" and there was a coronation of sorts as Lambert donned a sparkly crown to take his place as the rightful new king of Queen. Freddie Mercury is long gone having passed away well over a quarter of a century ago. So, in 2017 this is close and as good as it's gonna get. The Bridgestone Arena in the heart of downtown Nashville is an award-winning arena and is home ice for the Predators. It also hosts a wide array of sporting and musical events such as Queen + Adam Lambert. Upcoming events at the venue include Guns N' Roses, Foo Fighters, Chris Stapleton, Katy Perry and more. 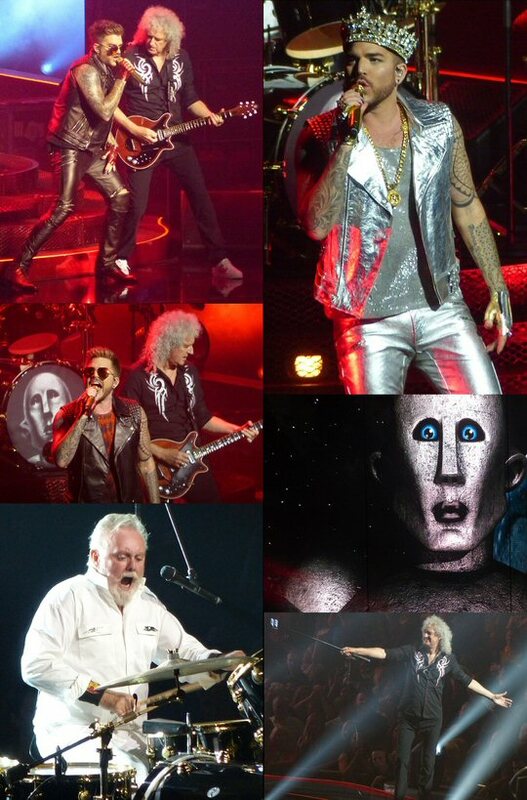 More scenes from the fabulous Queen + Adam Lambert extravaganza.